Functional Baltic Viking Helm, correctly made chainmail aventail or camail, 18 gauge steel and available with a standard 23 ½" head circumference. Options include 14 gauge or 16 gauge steel. Functional Gjermundbu Helm with correctly made chainmail aventail or camail, made from 18 gauge steel and available with a standard 23 ½" head circumference. Our Gjermundbu Helmet, based on a find at Gjermundbu, Norway, this Viking helm provides the re-enactor with authentic head protection. 14 Ga. 2mm steel, leather suspension, and chin strap. Based on the find at Gjermundbu, Norway; this Viking helm will provide the re-enactor with authentic head protection. Crafted in 14 gauge steel with a full leather suspension liner and chin strap. This Leather Trimmed Spangenhelm is made from 16 gauge steel, available with a standard 23 ½" head circumference and fully functional. Functional Leather Trimmed Spangenhelm with Angled Nasal is made from 16 gauge steel and is available with a standard 23 ½" head circumference. A Functional Medieval Spangenhelm made from your choice of steel and available with standard or custom sizes. Fully Customized Options include sized to your measurements, liner and steel finish. Functional Hastings Battlle Helm without mail. 18 gauge steel, 23 ½" head circumference. Options include 14 gauge or 16 gauge steel, Custom sized, liner and chin strap. The Hastings Battlle Helm With Camail is a functional helm.Correctly made chainmail aventail or camail. 18 gauge steel standard 23 ½" head circumference. Customized Options include: 14 gauge or 16 gauge steel. Our Gjermundbu Helmet is based on a find at Gjermundbu, Norway. This Viking helm provides the re-enactor with authentic head protection. 14 gauge steel, leather suspension, and chin strap. This Nasal Helm features a reinforced nasal guard and is leather lined with a chin strap. 16 gauge construction. The Leather Covered Norman Helmet is fully functional and comes with your choice of steel thicknesses. During the middle ages much of plate armor was covered in cloth, leather or painted to help prevent rust. The Norman Helm is functional and made from 16 gauge steel and is available with a standard 23 ½" head circumference. This functional Norman Helm is made from 18 gauge steel and is available with a standard 23 ½" head circumference. The Plain Norman Helm Functiona and made from 18 gauge steel and is available with a standard 23 ½" head circumference with Fully Customized Options. Functional quality Norman Helm Triple Trefoil Nasal is made from 18 gauge steel and is available with a standard 23 ½" head circumference. This Functional Spangenhelm Wide Nasal is made from 16 gauge steel and is available with a standard 23 ½" head circumference. A quality Medieval Norman Phrygian Style Helmet made from your choice of steel gauge thickness and standard head circumferences. Choice of adjustable leather liner, or padded cloth liner. The Spangenhelm was a mainstay helmet of the Viking era. Spangenhelms are characterized by steel strips (spangen) which are used to join the steel plates together. 16 gauge steel with leather liner and chinstrap. The Phrygian Nasal Helmet evolved around the Mediterranean, commonly used by Normans during the 12th century. 14 ga steel, adjustable leather liner, chinstrap, battle ready medieval helmet. The Phrygian Nasal Helmet evolved around the Mediterranean, commonly used by Normans during the 12th century. 2mm Steel, adjustable leather liner, chinstrap, battle ready medieval helmet. Spangenhelm style medieval helmet with omitted nasal for greater visibility. In 14 Ga. 2mm steel, the Archers Spangenhelm has an adjustable spider style leather liner and chinstrap. The Norman Nasal Helmet style of helmet was used when the Normans conquered England. It is historically correct as the Norman troops shown on the Bayeux Tapestry wear this type of helmet. It was made from four parts connected/ riveted with iron bands. This elegant Norman Nasal Helmet features a combined nasal and brow band with simple wave decoration. The welded construction is in 16ga. steel, with a fitted leather suspension and chin strap. The Norman Spangenhelm was a popular medieval European combat helmet design of the Early Middle Ages. The name is of German origin. Spangen refers to the metal strips that form the framework for the helmet and could be translated as braces, and -helm simply means helmet. This Norman Helmet with Aventail is made from 16 gauge steel with an integral butted steel mail aventail. Fitted leather suspension liner and chinstrap. Functional Viking Helm made from 16 gauge steel with ornate trim. Historic Spangenhelm design with goggles. Options available include custom sizing. The Wenceslaus Helm 10th Century is functional and made from 18 gauge steel and is available with a standard 23 ½" head circumference. 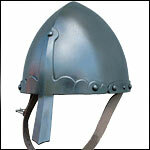 Functional Viking Helm is made from 16 gauge steel and is available with a standard 23 ½" head circumference. Quality Functional Vendel Helm 7 with correctly made chainmail aventail or camail. 16 gauge steel is available with a standard 23 ½" head circumference. Includes padded liner. This Functional Viking Helm with Oculars is made from 18 gauge steel and is available with a standard 23 ½" head circumference. The 8th Century Valsgarde Helmet, found in a Swedish excavation, illustrates the skills of the Scandanavian craftsmen. 14 ga steel, brass details, leather liner, chinstrap, Functional and Battle Ready. The 8th Century Valsgarde Helmet, found in a Swedish excavation, illustrates the skills of the Scandinavian craftsmen. 2mm thick steel, brass details, leather liner, chinstrap, Wearable and Re-enactment Ready. The Viking Spectacle Helmet is a variation of the Viking Spangenhelm and is named for the eyepieces formed with the nasal. This is one of the sturdiest Viking helmets. It is made from 2mm thick carbon steel (.09 inch thick). This version of the Viking Spectacle Helm features crossed, reinforced straps over welded 16 gauge Construction. A full leather suspension liner and chinstrap are included. From this chaotic time of the Dark Ages comes this magnificent helmet worn by the elite mounted troops of the Slavic princedoms. Vendel warriors were known for their fierceness as well as their elaborate armor. This helm is hand-made of 18-gauge steel, has a rough-hammered dome and a highly ornate face guard.